FORT PICKETT, Va. — More than 130 members of the Virginia Defense Force conducted training to improve their individual skills and professional development March 16-18, 2018, at Fort Pickett, Virginia. VDF volunteers trained on high frequency radio and mobile communications platform operations, incident management assistance, traffic control and access control and also took part in professional development classes including junior officer and senior noncommissioned officer leader development, property accountability, procurement procedures, officer candidate school and recruiting and retention. 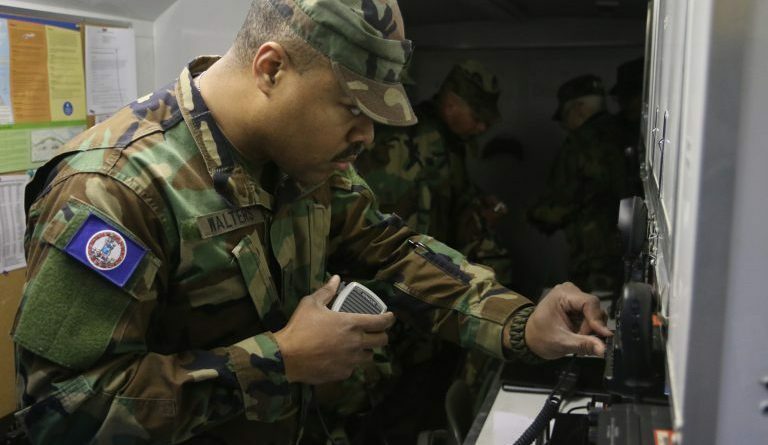 Communications support, operations center augmentation and security assistance are some of the many different mission sets the VDF provides as the all-volunteer auxiliary to the Virginia National Guard authorized by the Code of Virginia. Carlitti explained that the VDF plans to conduct four three-day training assemblies at Fort Pickett this year focusing on professional military education, small unit leadership and headquarters staff operations as well as refresher training on communications equipment and initial entry training for new members. Operational readiness evaluations will also be conducted to ensure personnel and equipment are ready for possible state active duty response missions. The VDF is authorized by Title 44 of the Code of the Virginia as the all-volunteer reserve of the Virginia National Guard, and it serves as a force multiplier integrated into all Guard domestic operations. The VDF reports to the Adjutant General of Virginia as part of the Virginia Department of Military Affairs along with the Virginia Army National Guard and Virginia Air National Guard. Members of the VDF volunteer their time for training and are only paid when called to state active duty by an authorization from the Governor of Virginia. Cpl. (Va.) Regina Harris, a Farmville resident who works for the Virginia Department of Corrections, was one of the VDF members training on the mobile communication platform. She has served in the VDF for more than three years, and the MCP was a new training opportunity for her. She explained that one of the things she liked most about serving in the VDF is the opportunity to learn new skills. Harris said she joined the VDF because she was looking for an opportunity to belong to an organization that helped people. She was familiar with the military because her father and daughter both served in the U.S. Army, and after learning about the VDF, she felt it was an organization she wanted to be a part of and to help other people. Sgt. (Va.) Kasui Young, a Newport News resident who works with security forces at Fort Belvoir, was one of the instructors for the incident management assistance class.He has served in the VDF for more than eight years and focused his course on hands-on learning to make it more interesting. Much like Harris, Young joined the VDF because he wanted to help people and stays because of the sense of teamwork and camaraderie. Pfc. (Va.) Mikayla Morgan was one of Young’s students, and while she has only been in the VDF for barely two months, she said it has been a positive experience. A native of Allegheny County and senior at Radford University, she plans to pursue a masters degree at Clemson and work with veterans experiencing PTSD. She learned more about the VDF from Dr. Jim Newman, one of her professors who is a major in the VDF. Morgan said that she was motivated to join the VDF after seeing all the hurricanes that hit different parts of the country in 2017. She explained that she wanted to be “on the front lines at home” to lend a helping hand to those in need. Morgan was made a team leader during the training, and she explained that she learned a lot from the opportunity. “This is a way for young people to get leadership experience and advance skills in a setting where everyone wants to lift you up,” she said. In addition to current mission sets like interoperable communications, operations center augmentation, incident management assistance and public information, the VDF plans to train personnel for more general support to civil authorities and emergency response capabilities.